Fuzzy Thoughts: happy valentine's day! Need a last minute Valentine idea? You can print these out on heavy paper, then cut out the individual cards with fancy scissors, and there's lots of room on the back to address one to your sweetheart! Just download the largest size image for the best results. Of course, you don't need a sweetheart to have a happy Valentine's Day! I like to take this opportunity to show all the people I care about how much they mean to me - family and friends who are special and deserve gratitude for everything they do all year long (I'm just lucky to have two big sweethearts to share the day with, as well). Knitting time has been pretty scarce around here this week, as Munchkin Mitten was sick with a cold. I'm hoping to try out my new light tent this weekend, so maybe I will have a few photos to share next week. 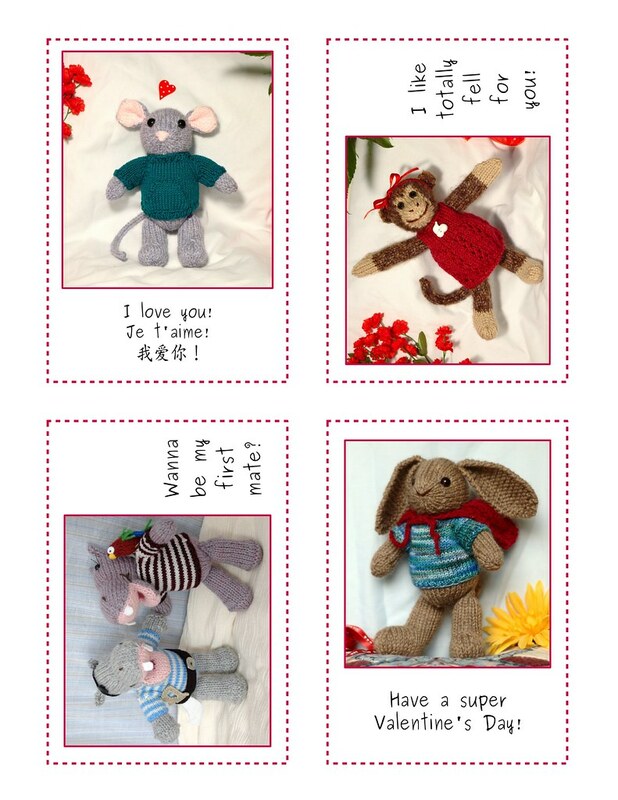 And if your in the mood for Spring bunnies and lambs, there's lots of action over on Ravelry! The knit-a-long is going for anther 5 weeks, so there's plenty of time to join! Posted by Barbara Prime at 10:04 a.m.